Gina is a yoga instructor and travel enthusiast who currently resides in Portland, Oregon. She caught the travel bug pretty early on in life, but didn’t have the opportunity to travel abroad until June 2013, when she embarked on her first transcontinental journey to Phnom Penh, Cambodia to get TESOL certified through LanguageCorps. It was her goal to acquire this certification and then teach English in Thailand a teach English, making it possible to economically sustain all the jet-setting she planned to do. She has had the pleasure of not only bowing into the peace and wonder of Cambodia, but also has ventured to southern and northern Thailand, and also Luang Prabang, Laos. She is now back in the United States, nurturing what she learned while teaching English in Thailand. The experience was one that enriched and empowered her life on a physical, mental, emotional and spiritual level and truly created the space for lasting change. The golden sun is going down on another day here in Chiang Mai, the land of kindness. I realize that Thailand as a whole is known as the “land of smiles”. However, I have not witnessed as many outward, generous expressions of kindness as I have in this city. I went to the dentist today to have the first teeth cleaning that I’ve had in an awfully long time, and naturally I was white knuckling the chair and squirming because my teeth have become very sensitive of late. The sweet woman dentist was so attentive and even empathized with me about her own sensitive teeth as she held my forearm in a gesture of comfort while turning the teeth cleaner down to the lowest speed. Later on, I went back to the same dentist office to bring in the other portion of my payment. I spoke with a different Thai woman at the reception desk, whose English was a bit limited, but she generally understood what I said when I broke it down. She began to tell me a bit about herself and brought up wanting to learn English, but had no time since she worked every day. She had also mentioned that her sister was a Catholic nun and that she goes to visit her at the convent often. I stayed for a few more minutes, both of us laughing as we tried to understand each other. I went to open the door to leave and she says, “God bless you” with a huge smile on her face–I couldn’t help but return the sentiment, since she was such a sweetheart and did so well with her English conversation. Next, I went to AUM, my beloved vegetarian restaurant, and had the nourishing, creamy avocado maki with the bright carrot, orange and ginger juice. I was craving something a bit sweet after, so I stopped into a nondescript cafe on my stroll home. I crossed the threshold and I greeted the proprietress with the customary, “Sawadee ka” and she answered me immediately in English with a warm, “Hello. How are you?”. This woman exuded non judgment, warmth, kindness and confidence in both herself and her establishment. She made me feel right at home, and went on about how much she loved the embroidered cotton tunic that I was wearing, because it looked so lightweight and the blue color matched my eyes. Who doesn’t like getting complimented immediately upon meeting someone the first time? She guided me over to the pastry case to see what kind of sweet I would like, and I chose the perfect, delectable almond brownie. I took my cute, baby pink cushioned seat and surveyed the scene, which slightly resembled a British tea house that I used to frequent in San Francisco. The late afternoon light filled the entire place, brightening up even the dark cherry wood of the tables and chairs. It matched the amount of warmth that I was receiving from Yupa, the proprietress. I stayed only for a short time, but the place made a lasting positive impression on me. I would definitely be back. I cannot help but feel so incredibly blessed to be here, having these magical interactions with seemingly complete strangers, which convinces me evermore that there is so much good left in this world. God bless me, indeed. Do you have a story about your time teaching English abroad? 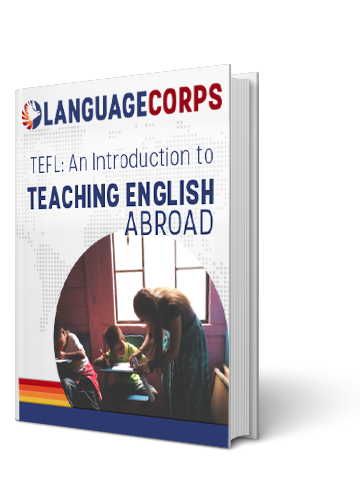 Email teach@languagecorps.com!